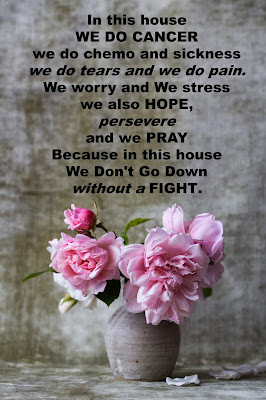 As we close our March month of Mantras, it only seems appropriate to finish with our Cancer Creed... it has been the hardest of truths to share as we walk this cancer road... for we do the tears and we do the pain, the worry and the stress. No one wants to admit it, but when we peel back the veneer and let the honest speak... the fear and the dark of this shadow valley... they are there. But so is Hope, and Faith and Joy and Courage! May you find that there is always Grace enough for each step of the Journey.